Hey guys, this has probably been answered time and time again but whats the point of a forum on VWs if you don't answer questions that have already been answered hundreds of times? Anyways, Im building my 68 and am going to convert the front back to a Link Pin Beam. I recently picked up a JD2 Model 32 Hydraulic so ill build my own Beam, and Pan Head from 2" .120 wall DOM so I can push the beam forward a little bit. Im going to go 6" wider than stock and have an old Link Pin Beam that I can use as a guide. Ill be doing longer swing arms too. My question is, am I better off ditching the Leaf Pack and going full Coilover? Or should I go with 6" wider and stiffer Leaf Packs with a Reservoir Shock? Or a combination of both? Im not concerned with staying SCORE compliant as I won't race this thing, its purely for my own enjoyment. Ill jump it, bomb fire roads, and drive it on the street so it needs to be strong, reliable, and street savvy. Speaking of longer Trailing Arms, who makes good ones? Preferably not cast. spend the few extra bucks and run the 7/8" shafts they hold up better. 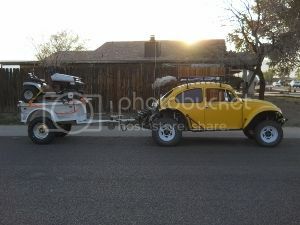 VW Volkswagen & Baja Bug General Discussion Reinforce your tie rods!! !